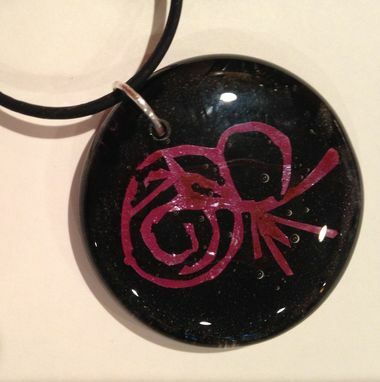 This fused glass pendant design resembles the cern particle decay image. The pendant is made by fusing glass and sandwiching copper sheet between layers of glass. Holly was great to work with. She sent sample images of previous projects, described the technique she intended to use very clearly, and was open to suggestion on the execution (I chose to go with her expertise, since I have no idea about these things). Holly produced three different options and allowed me to choose the one I liked best, which was a very nice surprise. She was able to adjust my shipping address to work around my needs, and get the pendant to me before I needed it. I will absolutely work with Holly again on future projects.